Preventative Health: Could Genetics Be Causing Your Migraines? There are hundreds of millions of people around the world who suffer from migraines. Migraines can cause debilitating pain that goes beyond a run-of-the-mill headache. Along with severe pain, migraine sufferers could experience symptoms such as nausea, sensitivity to light and sound, visual disturbances and even lightheadedness and dizziness. For some people, migraines go beyond being an occasional inconvenience and become something that impacts their quality of life on a regular basis. Sometimes, medication holds the key to relief, while others find relief in preventative health methods. But what’s causing your migraines to happen in the first place? Thanks to a study done in 2016, it looks like your genetics may hold some answers, and potentially, some solutions. 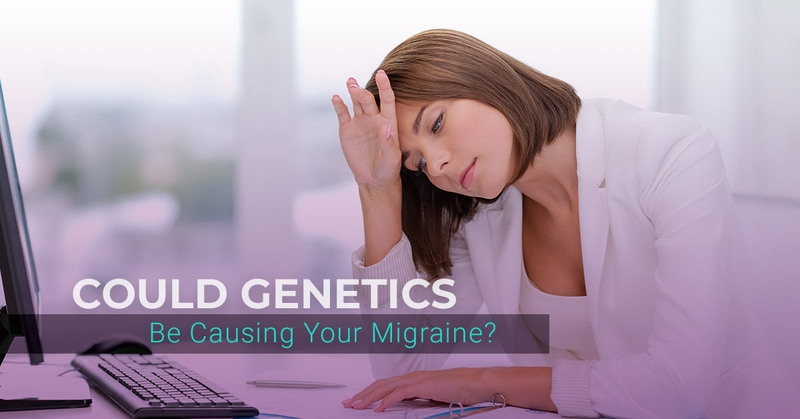 Is Genetics the Cause of Your Migraine Pain? Neuronal dysfunction. This was the theory that the pain of migraines was caused by issues with the neurons in the brain, potentially due to damage or deterioration of the neurons and their ability to properly send messages throughout and to the brain. Vascular dysfunction. This theory supposed that the cause of migraine pain was due to dysfunction with the blood vessels, particularly with those in the brain. This would prevent the right blood flow throughout the body and especially into the brain. The theory was supported by the fact that patients with migraines are at a higher risk for other vascular dysfunction-related conditions such as cardiovascular disease and stroke. A study published in Nature Genetics in 2016 has revealed evidence that strengthens the argument that vascular dysfunction is, indeed, the underlying cause of migraine pain. The study looked at the genetics of nearly 60,000 sufferers and found 44 genetic variants, many of which are linked to vascular control and development. What this study, along with years of anecdotal evidence gathered by doctors, points to is the fact that if you suffer from migraine pain, it’s likely that you inherited the condition from your parents. Some studies suggest that if one or both of your parents have migraines, then you have a better than 50% chance of having them, too. There is probably not a specific “migraine gene” but conditions that cause you to be pre-dispositioned to migraine pain that is caused by genetics (such as, for instance, the vascular dysfuntion that’s mentioned above). Interestingly, there seems to be an even stronger genetic link when your migraines include visual auras. These are disturbances in your line of sight that some migraine sufferers experience even if they don’t have any symptoms of pain. But how could genetic testing help battle your migraine symptoms? There are a number of ways. It could help develop new treatments and medications. As scientists and doctors learn more about what’s causing migraines, they’ll be better able to develop medications and treatments that address the root cause. Because more evidence is pointing to a link between migraines and vascular dysfunction, then they’ll be able to develop medications and treatments that aid with the flow of blood through the blood vessels of the body and brain and hopefully help ease or eliminate migraine symptoms. It could help you address the underlying cause. If you know that you have a genetic predisposition to migraines, then you can take action early. Fueling your body with the right supplements that support cardiovascular health may help prevent the onset of migraines. Additionally, if you know it’s an issue, then you’ll be able to take charge through other preventative health measures like eating right and getting the right exercise for your genetic makeup. Offering support. It’s tempting to try to act like your migraine is “no big deal” or feel ashamed that they are preventing you from participating in work and leisure activities. Supporting family members and letting them know that you understand and they aren’t alone can give them the strength to care for themselves. That alone can help prevent and ease migraine pain. Compare migraine tracking data. If you chart your migraines, share information with each other. That may give you insights into potential triggers that you might share and give each other ideas about how to avoid them. Share your family health history. Knowing your family’s health history is so helpful when it comes to not only migraines but preventative health measures of all kinds. If you don’t know your family’s health history, then genetic testing could also provide you with valuable insights. Do You Know How Your Genetics Are Impacting Your Health? As research continues to uncover the important role that our genetics plays in our health, individuals can start to put this knowledge to work for themselves. Using the power of genetic testing, KlothoGenics can help you gain insight into your genetic makeup and use that knowledge to help you get (and stay!) healthy. Knowing what’s in your genes can tell you which diets, exercises, and supplements are best for your genes. When you know that, you’ll be able to use preventative health measures to achieve greater well-being in your daily life as well as your athletic pursuits. Want to learn more? Schedule a free 15-minute consultation with our team to learn more about our services and how we can help you.